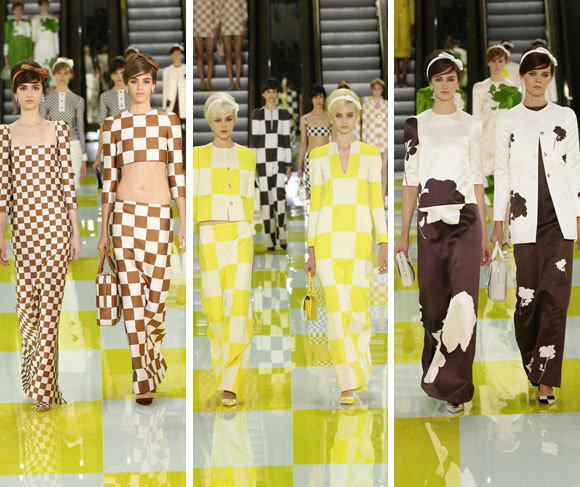 Last fall during Paris Fashion Week, Louis Vuitton debuted its spring/summer 2013 collection with a show that featured four escalators installed on the runway (genius idea, Marc Jacobs). This is the first runway collection to not feature the signature LV logo, but instead put the spotlight on the Damier check. The whole show was very graphically inspired and I loved the simple silhouettes and mod vibe. For this manicure, I wanted to capture the feeling of the show on my nails. It's very simple nail art (maybe too simple? ), but very clean. For my base coat, I used three coats of OPI Funny Bunny. I've been using this polish so much lately that I'll spare everyone the details. I layered it with a check pattern using two coats of Sinful Colors Firefly, a shimmery canary yellow. I started out by cutting pieces of tape and laying them in a lattice pattern, but it just wasn't coming out quite right. I ended up starting over again and freehanding the stripes. It's a little messier than tape would be, but because my nails are so small it gave me more freedom to put the checks where I wanted them. For my accent nail, I swapped out the yellow for a brown with a subtle shimmer, OPI Wooden Shoe Like to Know from the Holland Collection last year.